Lately, at least here in Southern Baja, there seems to be a dearth of live, or even dead bait. It happens. You still have to do your best to raise fish. I mean, you’re already here. It’s no one’s fault that the bait gods just didn’t happen to smile on your particular vacation dates. So be it. Be prepared. Get ready to troll. Cover some water. I get asked all the time what would I recommend. I usually don’t get hung up on having every color in the rainbow. The days when I neede two kinds of every conceivable lure is long gone and disappeared with the days of cheap airline tickets. Besides, I’m too lazy and too old to carry that much gear anymore. Now, I bring one dark and one light colored trolling feather in small, medium and large. That’s it. If my fishing partner or partners is bringing gear, I cut it back even further. Let them carry the extra and pay for it! But, honestly, agree among yourselves who is bringing what. Gear can be shared as can the weight and the cost. No sense in duplicating efforts and, given the penchance for airlines to charge for every extra bit of weight, it’s ridiculous to bring tons of stuff that will never get used. Besides, you can only troll a limited number of lures at a time. There’s no logic in bringing 20 or 30 lures! Fight the urge. You can do it! Once you’re on the water, there’s a number of schools of thought on how to drag your lures and presenting a spread to the fish. Veterans have their own multitude of theories and mine is just one guy’s opinion. I used to subscribe to the technique of running light-colored lures during the brighter hours and the darker lures in the darker hours. Lots of fishermen do well with that. But, for many years, now, I’ve been most productive with staggering my lure colors. I run my brighter lures further back in the pattern. I run my darker lures closer to the white prop wash. If I have the ability to run more than 2 lures, I stagger them where one dark lure is right in the wash. Another dark one on the edge of the wash and then two brighter ones staggered further back beyond says the 3rd and 5th wave behind the boat. I believe the darker lures have a better presentation in the white water or near the white water where they create a more visible silhouette to the fish. Regarding trolling speed, my general rule of thumb is somewhere in the neighborhood of 6-8 knots. But I vary that. The important thing is how the lures are swimming behind the boat. I want the most action I can get from them so they create some kind of commotion. I am also often reminding folks that pretty much any fish that has the ability to bite one of these feathers has the ability to swim way faster than the boat. So goosing the throttle a few nudges to get the lures swimming correctly is a no-brainer. That brings up another important variable. Not all lures are created equal. There are pusher heads (flat faced/ concave faced) . Bullet heads (shaped like bullets natch). Bubble/Jet heads (drilled with holes to make “smoke” bubble trails). Slant heads (cut on an angle to dart back and forth or jump). And others. All of them have different characteristics. Some work better at different times than others. My general rule is the rougher the water, the more action I want from my lure to cut through all the surface disturbance on top of the water. I want them to stand out as something “different” up there to potential predators. To that end, again, trying to save space and weight is to pack bubble/jet heads or pusher head designs. I like dragging them behind the boat so that they come jumping out of the face of trailing waves then dive back into the water with lots of splash and action. If you only have small feathers or lures, consider making larger lures simply by sticking one inside of another. Also, if you want to get down deeper, especially when nothing is close to the surface, either stick a torpedo sinker or egg sinker behind the head of the lure or simply tie a torpedo sinker to a leader ahead of the lure to make it swim deeper. 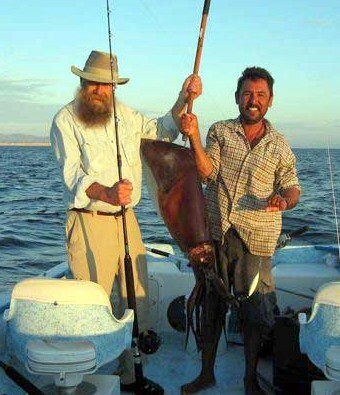 Giant Humboldt squid surprise alot of anglers when they first encounter them and find them to be voracious feeders and tough fighters when hooked! Squid can go upwards to…20, 30, 40 pounds or more…they don’t call them “giant” for nothing! The beaks of the giant squid aren’t something to fool around with when still attached to their owners! They’re like big parrot beaks! 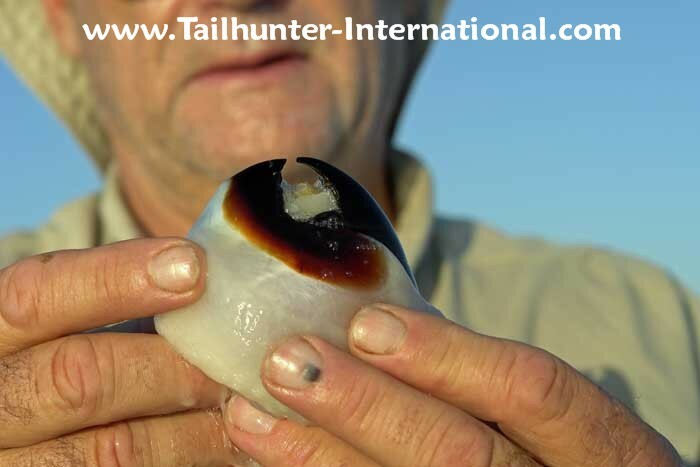 The Captain Victor tied on the heavy leaded lure and handed it back to the angler who looked at it curiously. He hefted it in his hand and like a weapon. And indeed, it looked like one. He turned it around in his hand. The heavy leaded pipe was about a foot long and filled with cement. It was painted white. The line was tied to one end. At the other, it looked like a multi-pronged grappling hook with about a dozen 2-inch long up-turned sharpened spikes. “Whatever bites this is gonna be interesting,” he said as he put his heavy 4/0 reel with 60 pound test into free-spool and dropped the lure over the side. Weighing about 2 pounds, it dropped quickly into the depths about 500 yards off the rugged Baja coastline. “Mas linea..more line…more line,” said the captain with a mixture of hand gestures and broken Spang-lish. “Muy profundo aqui…very deep here, “ as he pointed down into the cobalt morning waters. “Ok-dokie, amigo” said the angler with a shrug. The heavy rod and reel continued to play out line. The captain touched the rod as a sign to stop. The angler put the rod into gear and figured he was about 400 feet straight-up-and-down. The Captain Victor motioned for the angler to reel slowly, but at the same time raising and lowering the rod in a sweeping motion stopping the retrieve and letting the heavy jig drop back and winding a few cranks more. The angler took about half a dozen sweep-and-cranks and suddenly the heavy beefy rod went over double nearly pulling the angler to his feet! Grunting he struggled to turn the handle of the straining reel. He looked up at the grinning captain now smiling smugly. “Big squid! Calamar grande!” said Captain Victor with a big satisfied grin and arms folded across his chest. Sometimes you really have to watch what you ask for. Often folks want to know if the squid are biting and this just happens to be about that time. They’re not always “on time” and the bite is cyclical, but at least for us in La Paz, we get a run of squid in the spring and summer. Like other sea creatures, it’s not like they send out a memo or anything. But, when they show up, they generate alot of excitement. Not only are they fun to catch and extremely feisty when hooked, but they are just plain fascinating. They’re the stuff of story, legend and sea-monster! When folks come down, they normally, aren’t quite ready for what awaits. 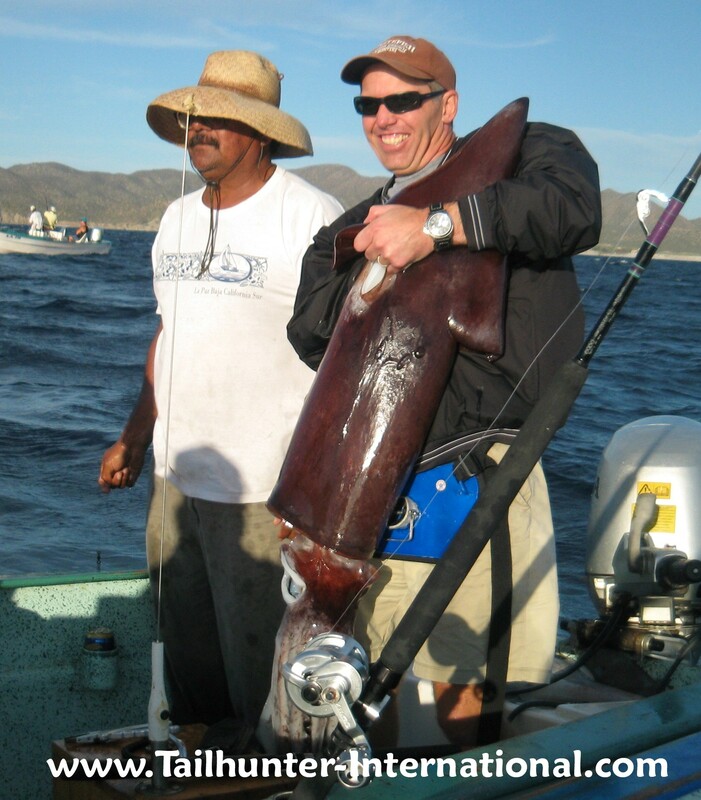 The “Humboldt” squid we normally get can be as small as 5 pounders, but 40-100 pound beasts are not uncommon. When the squid “float” (come near the surface from the cold depths) to where they can be caught, often many boats and pangas will pack the area. If the big squid are there, it’s not long before heavy rods and double-bent anglers are pulling mightly as if small refrigerators are hanging on the ends…which isn’t too far from the truth! The vessles are often quite close and once the bite starts, it can get pretty crazy as the wiggling-squirting cephalapods get close to the boats. A good tip is to let the struggling animals finish their squirting BEFORE bringing them aboard! Between the vessels, big firehose-sized geysers of water and ink are often seen raining down and spraying anyone within range. Yells and laughs as well as choice bits of profanity often permeate the scene. In fact, it’s often a good idea to dispatch the big uglies before bringing them aboard at all. Squid are voracious and aggressive. Just because they’re hooked doesn’t mean their beat. A third of their body length is a mass of tentacles. An, unlike an octopus, the “suckers” on a squid’s tentacles aren’t little suction cups. They are concentric circles of teeth surrounding a little beak that can easily break skin when wrapped around the nearest leg, arm or finger. Certainly, you don’t want to get an appendage near to it’s parrot-like beak which is capable of really doing damage and can take off a finger. Or they can quickly gouge out a chunk of an angler. Make no mistake, while small squid in a bait tank can be fun to play with, the Humboldts are dangerous critters. They are opportunistic feeders and the large ones have been known to attack sharks, tuna and even the occasional diver…not to mention each other. In fact, the heavy jig used to catch them is painted white to resemble a smaller squid enticing a larger squid to attack it. Indeed, the squid are cannibalistic and many times, as you’re bringing a squid to the boat, it will often feel like it’s no longer struggling and has turned to dead weight. If the water is clear enough, you can often see other squid attacking and hacking the one squid impaled on the jig. There’s no fraternity below the surface. Eat and get eaten! It took some grunting and no shortage of sweat and elbow grease to get the big 50-pound squid to the panga. As per the captains instructions, the angler let the big animal empty it’s jets of water and black ink before bringing it into the panga. Wiping his brow, with the back of his fist, the angler laid down the rod in exhaustion. “Muy bueno por carnada…good for bait,” smiled Captain Victor as he hacked off one tentacle and wrapped it around a larger bait hook ready to go look for some real fish. “But first, let’s catch a few more!” he added tossing the heavy jig back overboard.